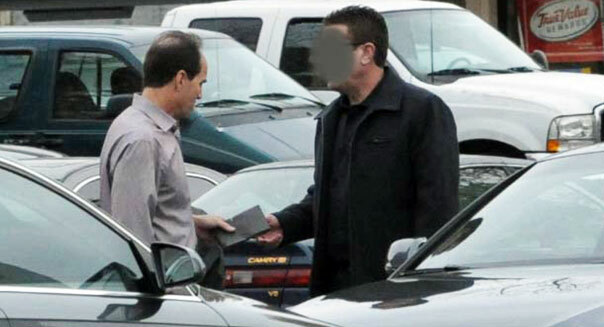 U.S Attorney's Office/APIn this undated FBI photo, KPMG partner Scott London, left, allegedly accepts a $5,000 cash bribe from California jeweler Bryan Shaw earlier this year. NEW YORK -- The California jeweler who gave a former KPMG auditor cash, an expensive watch and concert tickets in exchange for inside information about public companies has agreed to plead guilty to one count of conspiracy to commit securities fraud, according to court papers. Bryan Shaw, the jeweler who took tips on Herbalife (HRB), Skechers USA (SKX) and other companies from his one-time golfing buddy Scott London, agreed Monday to pay around $1.3 million in restitution and will continue to cooperate with the government as part of a plea deal with federal prosecutors, according to the documents. Shaw is expected to appear in federal court later this week to formally enter the plea. His lawyer, Nathan Hochman, a partner at Bingham McCutchen in Los Angeles, didn't respond to a request for comment. London, whose 29-year career at KPMG ended in his firing and arrest last month, had served as the head of the accounting firm's audit practice in Los Angeles. "These two men were close friends who shared dinners, concerts, sporting events and secret information that brought profits to each of them," Andre Birotte Jr., the U.S. attorney for the Central District of California, said. "London provided, and Shaw was all too happy to use, proprietary information that should have remained confidential." According to information filed by the U.S. Attorney's Office, London gave Shaw insider tips and trading advice about five public companies during a two-year period. In return, Shaw gave London thousands of dollars in cash, a Rolex watch and tickets to a Bruce Springsteen concert, among other things. Harland Braun, London's lawyer, didn't respond to a request for comment. In exchange for cooperating with the investigation and pleading guilty, Shaw might get a lighter punishment. Under his plea agreement, the government said that as long as prosecutors are satisfied with Shaw's cooperation, they will recommend a two-level reduction in the offense level that dictates sentencing guidelines. A spokesman for the U.S. Attorney's Office said the maximum sentence for a conspiracy count was five years. He declined to speculate on how much of a sentence reduction Shaw could get. In addition to Skechers and Herbalife, London is accused of leaking information about Deckers Outdoor Corp. (DECK) as well as plans for mergers between Pacific Capital Bancorp and Union Bank and RSC Holdings and United Rentals (URI). London's formal arraignment is set for May 17. Braun has said London will plead guilty.